Custom Protect Ear better serves their customers when it comes to personalized hearing and communication solutions. Surrey, British Columbia, July 5th, 2012. Custom Protect Ear is proud to announce they will be distributing Sensear products to better serve their customers. Both companies, Custom Protect Ear (CPE) and Sensear , are communication and hearing protection specialists focused on providing clear communication and hearing protection in noisy environments. Custom Protect Ear provides personalized hearing protection, dB Blockers™, which will integrate with select Sensear Smart Plug and Muff products. Sensear’s SENS (speech enhancement noise suppression) technology combined with the fit of a dB Blocker will give the wearer a radio communication and hearing protection experience ‘like they’ve never experienced before’. Combine that with Sensear’s spatial recognition and the wearer is completely in touch with their surroundings. These two experiences combined will help reduce the ongoing ‘cost of noise’ in work environments. Click here to see the Sensear Products on Custom Protect Ears Website. dB Blockers™ offer “The Smartest Hearing Protection in the World”, especially where interpersonal communication is required. The dB Blocker technology will reduce the cost of noise”; the cost of noise is hearing loss, productivity and risk management. Custom Protect Ear’s flagship product, dB Blockers™, eliminate hearing loss, mitigate risk management, and enhance productivity through effective communication. “There is an underlying problem with the growing cost of hearing loss prevention in noisy work environments. It was documented that 40% of the companies surveyed reported that they had thought their workers lost up to 30 minutes a day when trying to communicate in noise. Plus, the average cost of hearing conversation programs is $310 per employee per year. With these costs combined with the workers compensation claims doubling in the last 10 years, companies are feeling the squeeze to their bottom line. There is also the issue of ‘human cost of risk management. It is more important to reduce or eliminate accidents and fatalities in the workplace. If workers cannot hear or communicate, then it’s not clear, and hazards cannot adequately be avoided. It is only a win – win when workers are provided with the right hearing and communication devices that allows them to do their jobs in a noisy workplace.” says Custom Protect Ear’s, Jeffrey Goldberg. Hearing protection and communication devices need to enable workers to have operational awareness in noisy environments. It is the mission of both Custom Protect Ear and Sensear to provide workers with the same experience in high noise induced areas as they would in low noise areas. Custom Protect Ear’s inventory of Sensear products will allow their customers (Industrial Hygienists, Occupational Therapists and Safety Professionals) to access a total hearing protection and communication solution. The solution, dB Blockers™, will enhance productivity, save money, eliminate unnecessary costs and associated risks when it comes to providing workers with a safe working environment. Founded in 2006 in Perth, Australia, and with joint headquarters in Perth and San Francisco, USA, Sensear is a world leader in the development and manufacture of high noise communication headsets. From a global network of sales offices Sensear is selling to end users via distributors,dealers and resellers in the majority of countries around the world. Sensear’s patented combination of hardware and software, isolates, cleans and packages speech while suppressing background noise to a safe level. The award winning technology has been incorporated into both ear plug and ear muff headsets that, whilst retaining situational awareness, enable face to face, mobile/cell phone, short range and two way radio communication in the harshest and noisiest of environments. Founded in 1976, and with over 1 million wearers, Custom Protect Ear is North America’s largest personalized, industrial hearing protector manufacturer. Hearing conservation is our only business. We do not make hearing aid molds or disposable earplugs. This exclusivity allows us to devote all of our research and expertise to the innovation of better hearing protection. As a result, we have made significant technological advances in the development of superior hearing protection. How would you like to fix a problem you don’t even know you have? One that is sapping your company’s competitiveness? If your workplace is loud enough to require hearing protection then your business is under attack. – Your productivity is being seriously impacted. – Your cost of goods are rising from mistakes. – You’re spending at least $310/year for every employee in your hearing conservation program. – Hearing protection alone is costing you $150/person/year. – And on top of it all your supervisors are probably spending an extra 30 minutes a day trying to communicate in noise – @ $30.00/hour that’s almost $4,000/year. All of this is the Cost Of Noise. The cost of noise saps productivity and adds expense to companies. Reduce or control the cost of noise and profits will flow straight to the bottom line. It is a competitive advantage and many companies have recognized it. So if you and your company want to do something about the cost of noise? There’s a cure. We challenge you to take our dB Blockers to prove we can reduce your cost of noise. dB Blockers and they’re the smartest hearing protection in the world. Why smart? 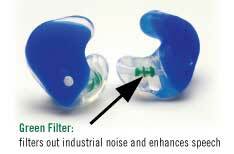 Inside each dB Blocker there is a little green filter, which filters out industrial noise and enhances speech. And it is also really a communication device. You wear these to protect your hearing and they’ll let you hear people talking to you. – Will cost a lot..
Well most of this is right except for the last point. dB Blockers actually cost less to use than cheap throw away disposable earplugs. Don’t believe me? Challenge us to prove it? Send us an email at hear@protectear.com and challenge us to prove we can reduce your cost of noise. ~ Jeffrey Goldberg, Custom Protect Ear.